"This family is amazing! A Nazi spy. A future SS officer. A brother in America oblivious to everything. And a sister who would kill us all." Germany, 1934 - SS officers entered the house of Hedwig Schultz and ripped her 14-year-old brother, Edmund, from her arms. He has been selected for an elite division of the Hitler Youth that will train him for indoctrination into the feared SS. Horrified, Hedwig enlists the help of her brother in America to thwart Nazi plans regarding the Final Solution of the Jewish people. It becomes a cat and mouse game as the family enters a world of Nazi spies, double agents, and the Underground movement. All the while, Hedwig must prevent their brother, Edmund, from becoming suspicious. One report of treason to his Hitler Youth instructors would result in death... or worse. I have been following Rhoda's progress and find each book better than the previous one. Elaine Baden is an outstanding reader who adds many dimensions to each book! Would you listen to Newborn Nazi again? Why? No, I wouldn't listen to this book again because it is a really long story. However, this does not speak for how great the book is. It is over 9 hours of quality reading and superb material. What was one of the most memorable moments of Newborn Nazi? Without revealing too much - the most memorable moment of this book was when Hedwig revealed that she knew what had really happened to her parents. Which character – as performed by Elaine Baden – was your favorite? Hedwig was the best presentation of a character by the voice over talent. She presented her as strong yet vulnerable. The moment in the book that particularly moved me was the event of the Hindenburg disaster and how it affects the family. I really didn't see that coming. This was a great story! The reader did a decent job, but I did notice a few punch ins that were very obvious and stuck out. Otherwise, this epic story is an awesome listen and well worth the investment! 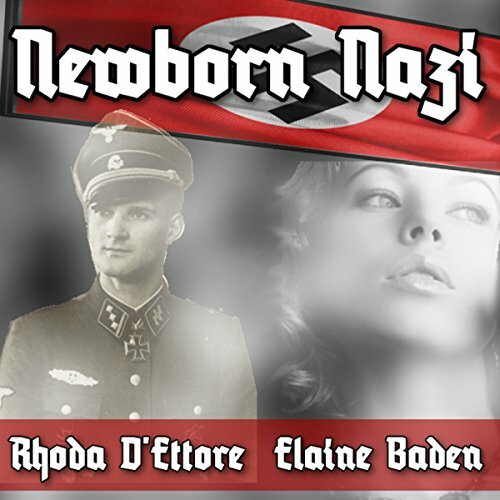 Newborn Nazi is another wonderfully written novel by Rhoda D’Ettore. The novel is about a German family who suffers much during Hitler’s rule. There are many stories out there both true and fictional about the lives of the Jewish people during that time, and those stories, more than any other, should be told, but I think seeing the world from a German point of view is also helpful because we don’t live in a black and white world were everything we are told or even see is true. The only other novel I’ve read like this is The Book Thief by Markus Zusak. In Newborn Nazi, we see the German world through Hedwig, a young German woman, and her brothers: one who is forced into a Nazi Youth camp and all but brainwashed into believing Hitler’s propaganda, one who is blackmailed into complying with a corrupt government , and a third who refuses to acknowledge what is happening in his home world, as he escaped to America before Hitler cemented his control. We see how easily people are coerced into lying to their family, spying on their family and friends, committing murder, and even turning on their country when those they love are threated. We see how this coercion, these lies and secrets can crumble lives and bring an entire race of people to their knees. As with all of D’Ettore’s novels, this one is full of twists and turns you never see coming. It is full of laughs, tears, love, and war. And most of all it has a strong female lead that teaches the reader that not everyone in Germany fell for Hitler’s lies, not everyone woman submits to the men in their lives who see them as nothing more than property, and more importantly, she shows how one person can truly make a positive difference in so many people’s lives. If it weren’t for her and people like her, her world could have been so much worse, which is hard to imagine since things were so horrific. She gives us courage, strength, and the desire to stand up for what we believe in and take care of one another. She says it all in one simple phrase, “All life is precious.” Hedwig losses everything in this novel, but she gains herself. She may not have gotten the life I wanted for her, but she lived a life worth living. I can’t wait to get my hands on more of this author’s work.--Author Jennifer Reynolds. A story about siblings during the ww11. The deeper the story goes the more you learn of each of the characters. Lots of twists and turns and revelations which are surprising. Absolutely loved the story and couldn’t stop listening. Narrator was amazing so you could actually put yourself in the characters shoes.